How did your life acquire a Franco-British dimension? I was born in West Belfast in 1963. The onset of the Troubles was one reason to go abroad. Both Gaelic and English were spoken around the house. My older brother was a fanatic about languages and went on to take a PhD in French Literature at Harvard, where he became a lecturer. After my O-levels, at the age of sixteen, I took the boat from Rosslare with a friend to visit France for the first time. Having hitchhiked our way to Paris, we lost each other in the evening, and I ended up getting on an RER train and spending the night on a bench in the suburbs. The great thing about hitchhiking is that it often inspires a great openness in the locals, who often speak surprisingly freely to strangers whom they know they will probably never meet again. When I returned to France as an eighteen-year-old before my French A-level oral, there was a dense and exciting atmosphere over the contest for the presidency between François Mitterrand and Valéry Giscard d’Estaing. For my French A-levels in Belfast, I had had the experience of being taught by an impressive Senegalese assistant teacher. It opened my eyes to the existence of the Francophonie, a large part of the world accessible to French-speakers. During my undergraduate studies at Trinity College in Dublin, I applied to go to, in order of preference, Quebec, Tunisia or France for my year abroad. As a British national in an Irish university, I was only able to get my third choice. One day, I received a phone call from Orleans where a language teacher needed a replacement, to start immediately. I went the following day and spent a year there in the company of teachers from around Europe, including an Italian girl, who was later to become my wife. You could call Paris and France an international hub. When I had finished my French undergraduate studies, I taught as a ‘lecteur d’anglais’ at the Sorbonne, Ecole Normale Supérieure and other places. I applied for a job at the ENSAE where the person interviewing me decided after a long conversation to offer me a place to start teaching debating, which I was quite engaged in. The classes were in English and were a great success with the students. We arranged a debating contest that pitted the teachers against the students, who ended up winning. 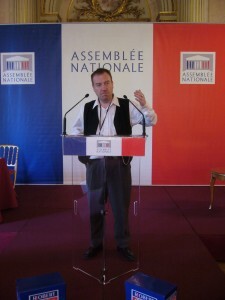 It was a great success, and led us to arrange the first debate between the ENSAE and the Ecole Polytechnique in 1989. With the Ecole Nationale d’Administration taking part, we needed a fourth team, for which we turned to Sciences Po. We arranged the first tournament in 1994 at the British Council and it was a great success with a turnout exceeding the rooms capacity. Hundreds of French students came to see their compatriots debating in English. The subsequent debates have taken place in rooms of the Assemblée Nationale, which have allowed over six hundred spectators to come to the final. We formed the French Debating Association in 1994. A hallmark is the Paris five style of debating, which draws large audiences because it is less dry and more entertaining than the standard World Style of British debating. Why go abroad, why go to France? I usually say yes and ask questions later. That has got me into a lot of trouble, of course, but it has also resulted in coincidences, which would not have happened if I had stayed at home rather than travel to France. Going abroad takes a leap of faith of sorts, and it means going outside your comfort zone. To be alone in a foreign country was a lonely experience for me at first. But it presents you with opportunities which you would not have had if you had not gone abroad. I met my wife in France. I feel I have in a way become half French its all about give and take. You bring your former cultural baggage to the new country and yet you also load up with extra luggage provided by the new culture. Its a heavier burden but its certainly worth it.